…you regularly use three or more different web browsers. …you know that third-party cookies aren’t leftover snacks from two previous social gatherings. …you have spent weeks trying to get two different web analytics packages to report the same numbers. …when someone mentions Amazon, you think of web services, not books. …you read TechCrunch more than AdAge (but you do read both). …you have a collection of books with illustrated animals on their covers. And one with a purple cow. …you know that a “callback” doesn’t necessarily involve the telephone. …the words agile, sprint, and stand-up don’t conjure up images of calisthenics. …you have personally consumed an API (and that didn’t involve eating anything, except maybe time). …you know at least three acronyms that end in -aaS. 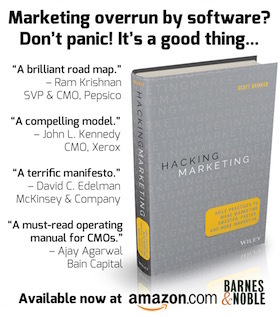 …at 2am you have wondered if “marketing automation” is possibly the greatest oxymoron of our time. …you have ever meditated in the CSS Zen Garden (and know that they don’t serve tea there). …you know that a RESTful web service isn’t relaxed or sleepy. …you know that a “statistically significant” test is not necessarily a meaningful one. …when you hear “the script doesn’t work,” you think of bad programming, not bad screenwriting. …you know that Cocoa Touch is not a flavor you add to your coffee at Starbucks. …you have ever been accused of performing the black rites of shadow IT. …you know that having Python in your LAMP stack is not a snakes-on-a-plane emergency. …you anticipate the demise of Internet Explorer 6 (IE6) as a kind of rapture. Are there other tell-tale signs of being a marketing technologist? Please share. Previous Post Should agencies show more -aaS? You bring technology opportunities to your IT team. 🙂 I made 9/10 on this one. does that make me a MT?? …you are working on your new dashboard, which has nothing to do with your car. …you crack a joke that your department’s shared rss reader is a feedlot. You think of RDFa in the same glowing terms as your golden retriever. …you can convert and idea into technology.